Solgaleo is a large, white Pokémon resembling a white lion. It has a blunt muzzle with a blue-gray nose and pale blue eyes. The top half of its face is a deep blue area that shows a constantly changing starscape. Four yellow spikes frame Solgaleo's head like a crown and two more pairs of spikes adorn either side of its lower jaw, and each spike separates large tufts of Solgaleo's mane. Solid ridges—red nearest Solgaleo's head and yellow farther away—poke out of each tuft along the middle, except on the tufts on its cheeks and chin, with the topmost part wrapping around the tip of the tuft. Overall, its mane creates the impression of a stylized sun. Around each leg is a dark orange band, and there is a black spot on each foot. It has three black toes on each foot with long yellow claws. At the tip of its tail is a large black spot with a thin yellow rim. 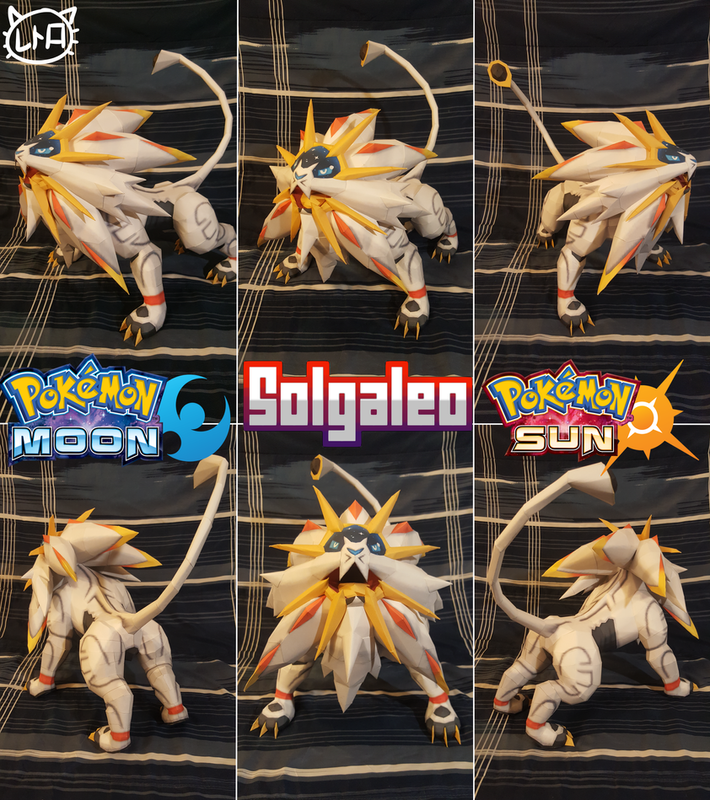 Notes: Solgaleo was built by SuperRetroBro. Thanks for building! Two textureless .pdo files are included in the package! Pdo files for use in Pepakura VIEWER only! Does not bring texture or does not appear on pdo.